This physically exerting work is predominantly men work. Already procuring the sheets in the jungle and transporting them to the Lodge is very strength- and time consuming. It needs special fate and ability to design the framework and twist the sheets in the right way. 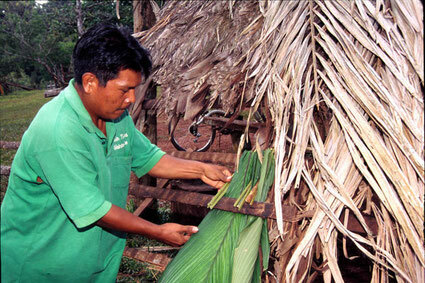 The Guaymies are able to build houses, which consist only of natural materials. Become acquainted with our building method and practice in twisting the palm-sheet-roofs.